& you know what? Shipping took only 4 days!! The contact was also very nice and kind, we had a little problem about the lenses, because they didn't arrive, but they sent a new pair immediately to me, and it only took 4 days. These Circle Lenses were for my Asuna Cosplay! I like that bright brown, which is close to orange/yellow. Look at that enlargement! *q* It's a dark light I used, so they don't shine that bright, but still, they're looking great brown/orange! They were very easy to put in and I didn't feel anything bad. First time wearing Circle Lenses by LensCircle - no problems at all. Easy to put in, easy to wear, didn't feel anything! 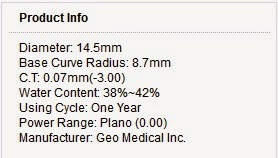 With "only" 14.5mm they're enlarging my eyes to a wonderful fitting size. It took them only 4 days to arrive, it was safe, also cute packaged!